Since today is the unofficial end to summer, I decided to share 5 delicious ways to grill corn. Each of these methods is something that I have seen friends do when they are grilling, and each method is delicious. 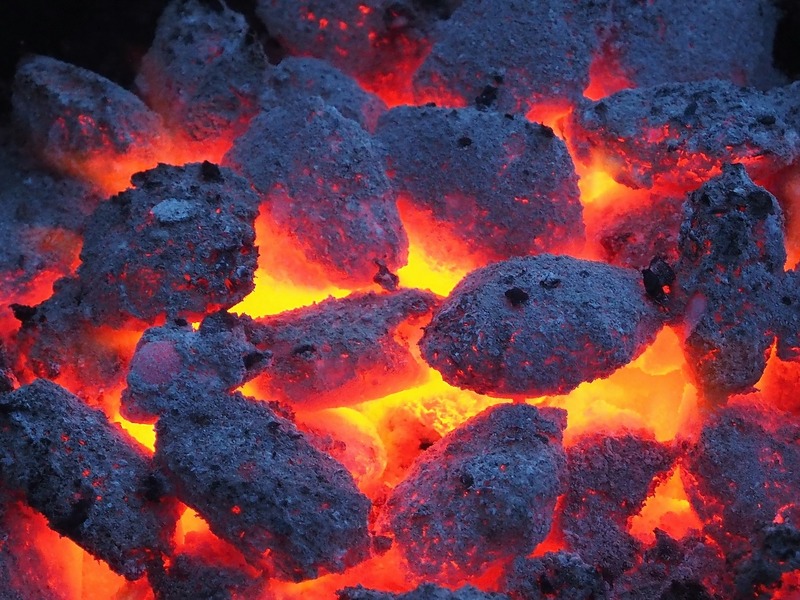 With the exception of one method, each of these techniques can be used on either a charcoal or a gas grill which makes it easy for anyone to grill corn. 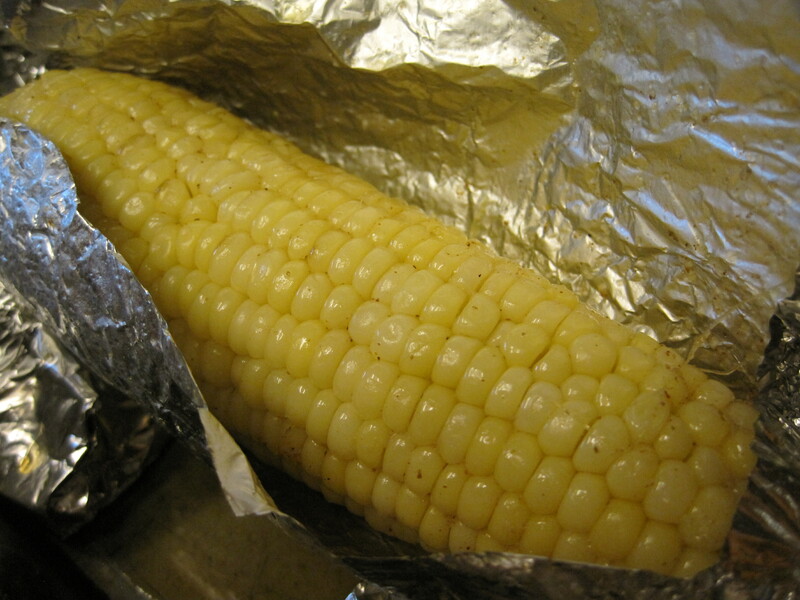 The first method for grilling corn is to remove the corn silks and husks, then wrap the corn in foil. Some people put butter or other seasonings on the corn before grilling while other’s leave it unseasoned until it is cooked. Either way is delicious, though some people complain that natural juices that leak from the corn seem to dilute the butter and other seasonings during the cooking process, so we usually end up adding additional butter when the corn is finished. We have observed that everyone has their own unique way of wrapping the corn. The corn is cooked on the grill for about 10 minutes on each side until it is cooked. 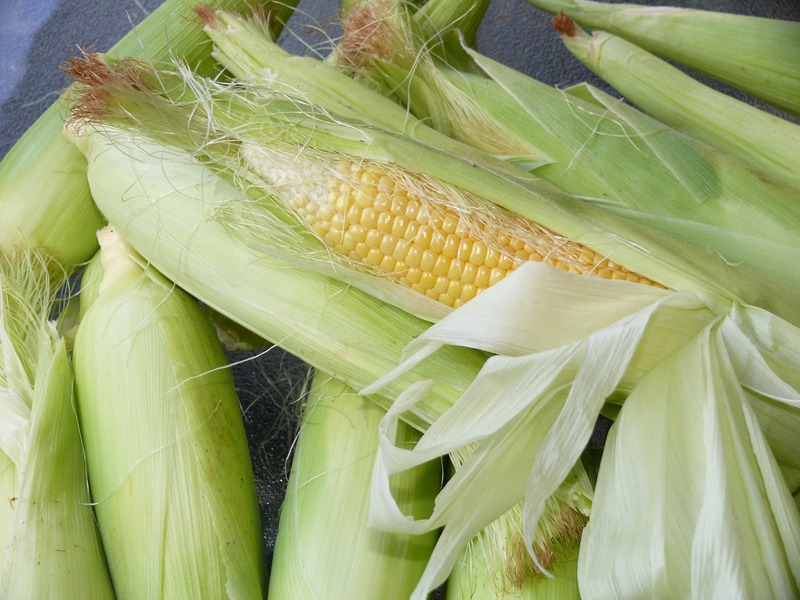 The corn cooked this way is moist and delicious, with only minimal carmelization on the cobs. 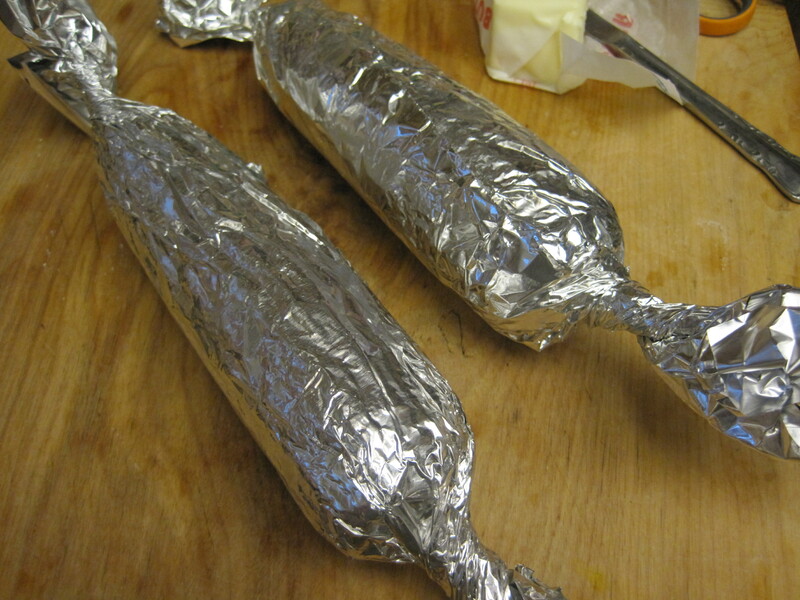 This method steams the corn in its own juices, and whatever seasonings you put on the corn before sealing it in foil. Another method for grilling corn is to grill it in the husk. Each person who chooses this method seems to have their own opinion of the correct technique. Some peel back the husk and remove the silks before sealing the corn back int he husk. Others leave the silks on claiming that it’s easier to remove them after cooking. Both groups soak the corn in its husk in water for anywhere from 15 minutes to a full hour. 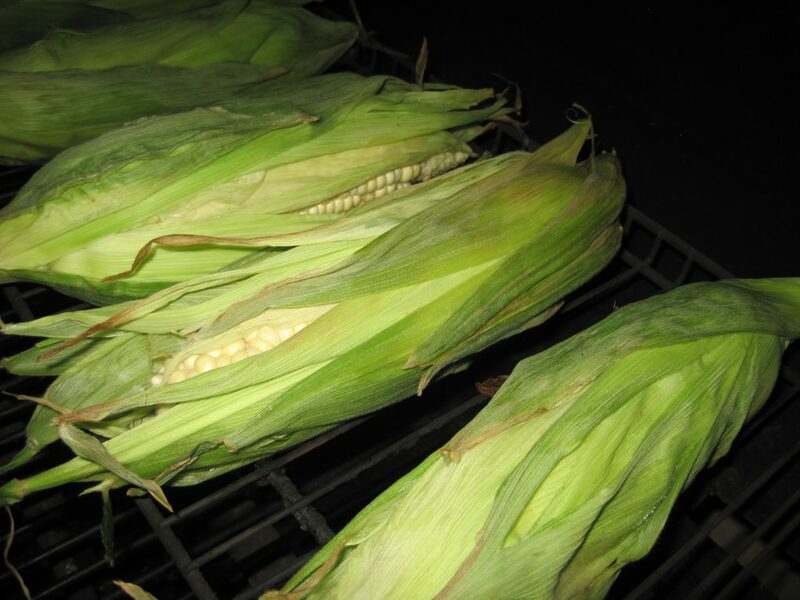 Once soaked, the corn is placed onto the grill where it is grilled for 10 to 15 minutes on each side. Some of my friends are insistent that you must wrap soaked butcher’s twine or strips of husk around the corn to ensure that it’s completely sealed prior to putting it on the grill. Other friends take a more relaxed approach and don’t mind that the corn is exposed to the grate and the flames. 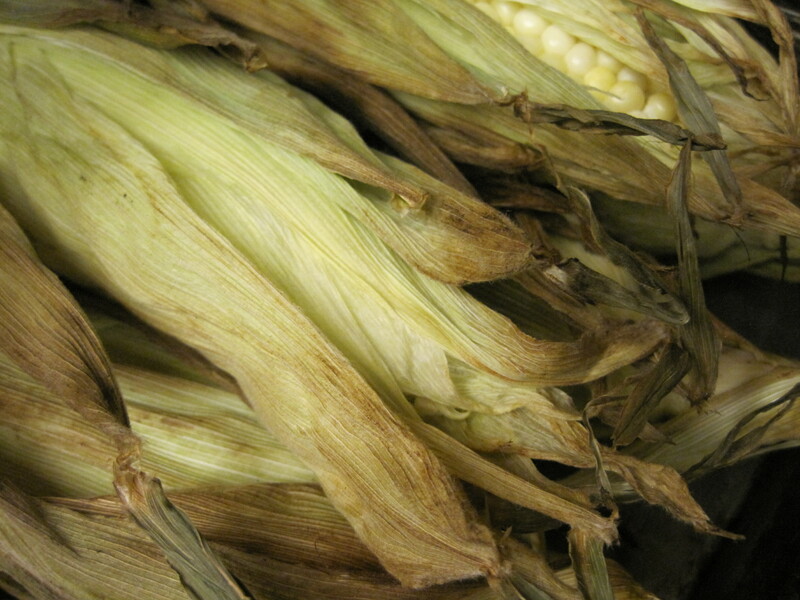 When the corn is finished on the grill, the husks will be anywhere from dried and brown to completely blackened depending upon the heat of your grill. Regardless of the exterior appearance, the corn inside will be moist and delicious. 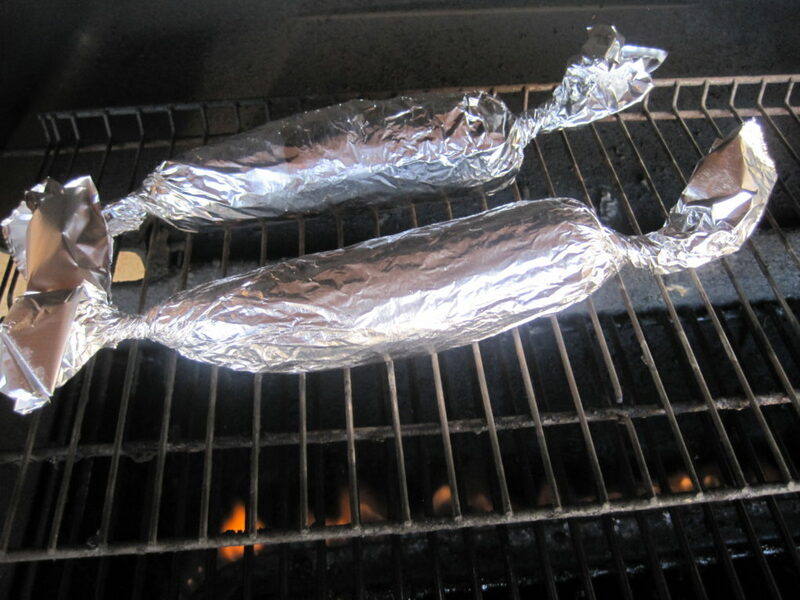 The next method for grilling corn requires the use of a charcoal grill. It’s similar to my father’s technique in the wood fire that I described in the post entitled Fire Roasted Corn and Potatoes. Very few of my friends prepare their corn this way, but it’s a favorite of my blogging friend Brenda. This technique is great when you are grilling for a large group because the corn is actually cooked in its husk in the embers n the bottom of the grill. When we have done this when we need the grill space on top for other things, but still want corn on the cob. Usually, we wait until the meat is cooked and stack it into a pan that we can place on the grill to keep warm. The pre-soaked corn, still in its husk, is then placed in the bottom of the charcoal grill and buried in the coals. This is a time when you want to ensure that your corn is completely covered with the husks and when butchers twine is advisable to hold the husks in place. It’s also a good time to soak the corn for a longer period of time. This is by far the simplest method for grilling corn, but it’s the one that people seem to hold the strongest opinions about. 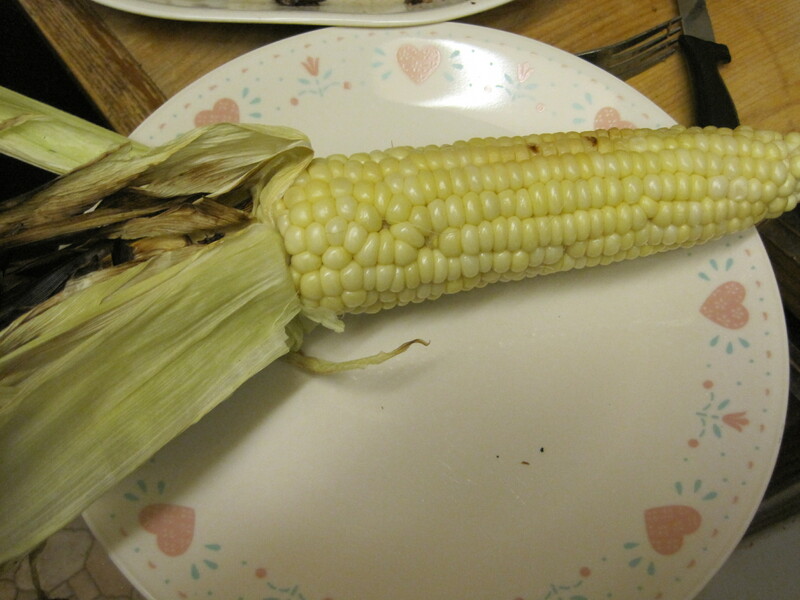 All you need to do is shuck you corn and place it unadorned and unprotected on top of the grill. 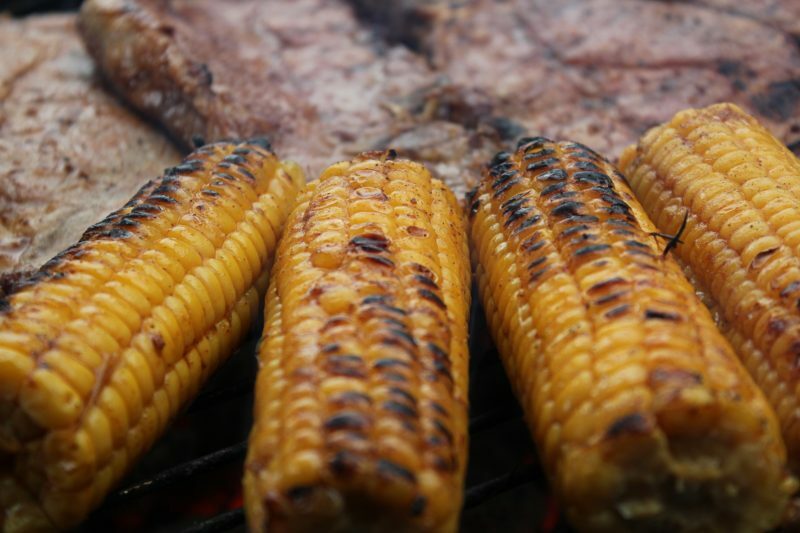 The corn is then cooked alongside of the meat on your grill, and is turned frequently. Some people swear by this method and believe that the carmelizaton and sometimes blackening of the corn kernels adds flavor. Others consider the corn burned and think that this is a waste of good corn. It’s a matter of personal preference. I have eaten corn prepared this way, and I enjoyed it, but I prefer my corn more moist. 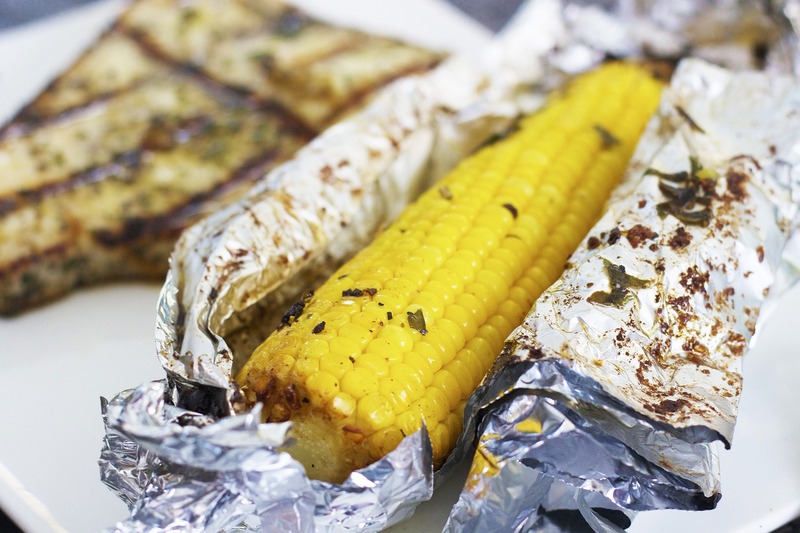 A friend of mine loves her corn grilled this way and has been known to place foil wrapped or corn grilled in the husk back onto the grill to get the added flavor and texture. If you’ve never tried grilling corn this way, you should definitely give it a try. This method is another controversial method for grilling corn, but it’s a great time saver when cooking for a large crowd. It involves pre-cooking your corn before grilling it. Some people grill the corn in the husks then remove it, cut the cobs into two or three shorter cobs and then insert skewers. One of my friends breaks the cobs into desired lengths then steams or boils it inside her house. Once the corn is cooked, she inserts the skewers and transports it out to the grill. 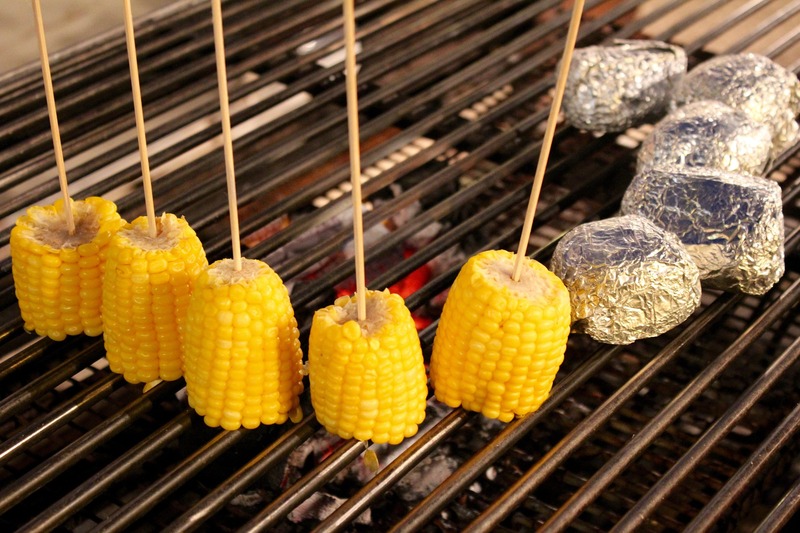 As she grills the meat, she arranges the cobbettes of corn, on their skewers around the grill sitting on edge. She has a pan of melted butter or olive oil, mixed with whatever herbs and seasonings she is brushing onto the corn nearby, and as she serves plates to her guests, she brushes the corn with this mixture just before plating the food. It’s simple, delicious, and helps to keep your guests fingers clean while they eat their corn. Bobby Flay grills serves 1″ thick coins of corn on the cob in this way and brushes with a chipotle cilantro butter. There you have it. Five ways to grill corn. We hope you’ll try one or more of these techniques at your end of summer barbecues then stop back and let us know which on you tired. 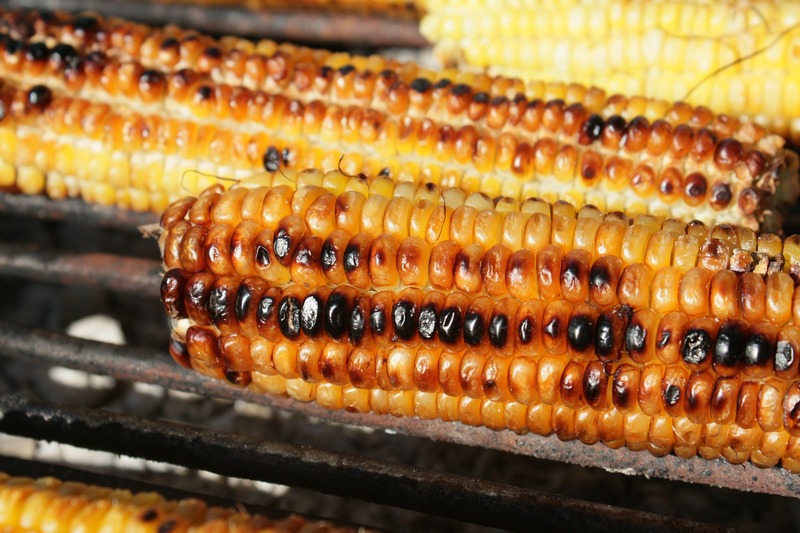 What’s your favorite way to grill corn? Is there another method that I’ve missed? Please leave a comment and let us know.